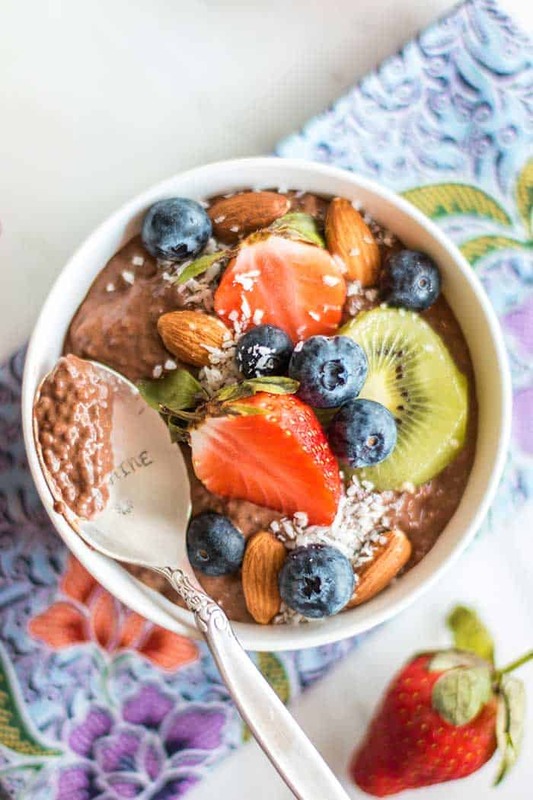 Chocolate Chia Pudding Breakfast Bowls will become your new weekday staple! 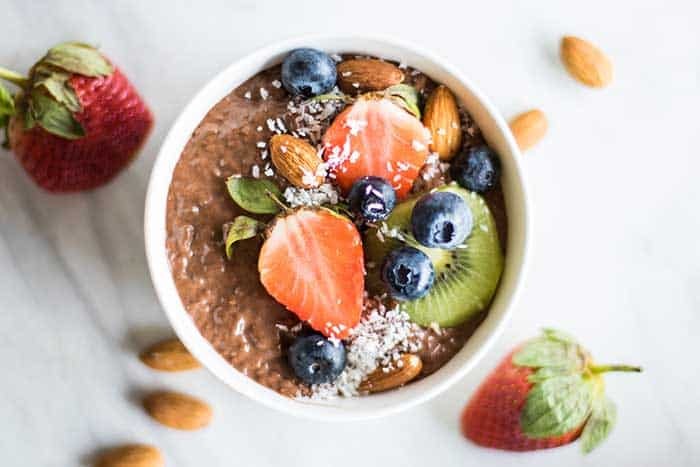 This healthy breakfast pudding is sugar free, paleo, vegan, and packed with healthy fats, protein, and fiber. Top with fresh fruit, coconut, nuts and seeds or nut butter (or a little chopped dark chocolate!) for a breakfast that tastes more like dessert. Is Chia Seed Pudding Good for You? 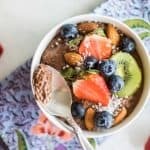 I recently updated my Whole30 Breakfast Chia Pudding, because in January, it becomes crazy popular. While it’s a great option for those with dietary restrictions, it’s also just delicious and great for anyone looking for a healthy breakfast that can be prepped ahead. Chia seeds are rich in nutrients. They are high in omega 3 fatty acids, protein, fiber, antioxidants, and fiber. A serving of this pudding contains half of your daily fiber requirement and 7 grams of protein. You can up the protein by topping this pudding with hemp seeds, nuts, or nut butter. Can you Make Chia Seed Pudding with Almond Milk? You can make chocolate chia seed pudding out of pretty much any liquid! I use coconut milk in this recipe because coconut milk is delicious! I love it’s creamy and rich flavor. To lower the calories in this recipe, definitely try using unsweetened almond milk. For a protein boost, if you are not lactose intolerant, regular dairy milk will also work. I mix coconut milk with water because all coconut milk is too rich for me, but you could use all coconut milk to make an extra decadent dessert pudding. No Blender? No Problem! : If you want to make chocolate chia seed pudding without a blender, sub 1/4 cup date syrup or honey in place of the dates. Use a whisk and mix quickly as you add the chia seeds. You will need to let them sit, and whisk again, and repeat several times prior to refrigerating your pudding. This method works fine (and I use it often! ), but it’s more difficult to get a smooth texture because it’s hard to prevent the chia seeds from sticking together. 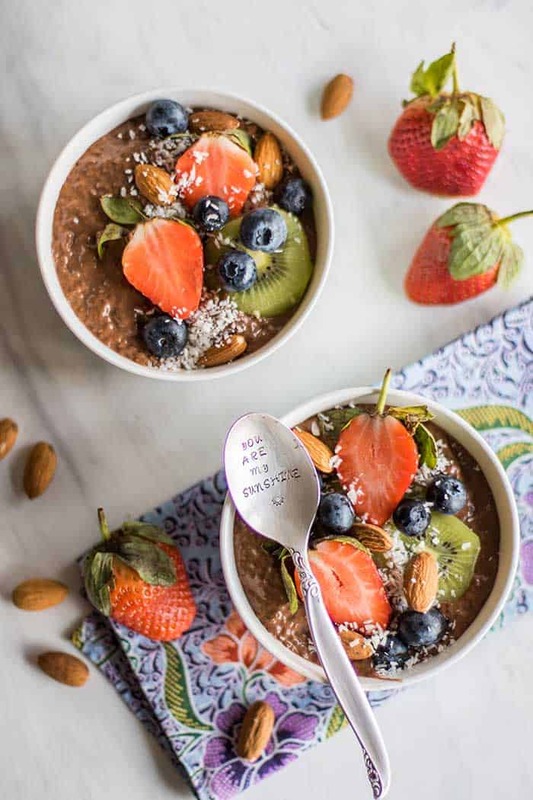 Make it Paleo: As written, this chocolate chia pudding recipe is paleo. Make it Vegan: As written, this recipe is vegan. These breakfast bowls are delicious, but also nutritious! Chia seeds are soaked in coconut milk, water, and pureed dates, until a thick pudding like texture is achieved. This pudding is great on it's own, or topped with fresh fruit and nuts. Soak pitted dates in hot water to soften. After they've soaked for 1-2 minutes, drain well and set aside. In a blender, add water (start with 1 1/4 cup), coconut milk, cocoa powder, dates, and vanilla. Process on high until the dates are smooth and a rich creamy chocolately mixture has been created. Add chia seeds, and then pulse to mix in. Do not overblend. The idea is not to blend the seeds, just to mix them in. This can be made in a bowl and stirred, but chia seeds gel and stick together quickly, so I find it easier to get them to separate in a blender. Allow chia seeds to soak for about 5 minutes, and then pulse again. Repeat 1 more time for the best textured pudding. Pour chia pudding into a sealed container, and allow to soak at least 1 hour. If your pudding is too thick, add more water to thin out until the desired consistency is reached. * I use a full 1 3/4 cup water in this recipe and get a really thick pudding texture. However, I have had readers comment on my other chia pudding recipe that the texture was too thin. This is because different brands of chia seeds soak in different amounts of water (age of the chia seeds is also a factor here). To prevent your pudding from becoming too thin, start with less water and add more until your desired consistency is reached. You can also just use the full amount, and then add a few tablespoons of extra chia seeds if it turns out too thing. 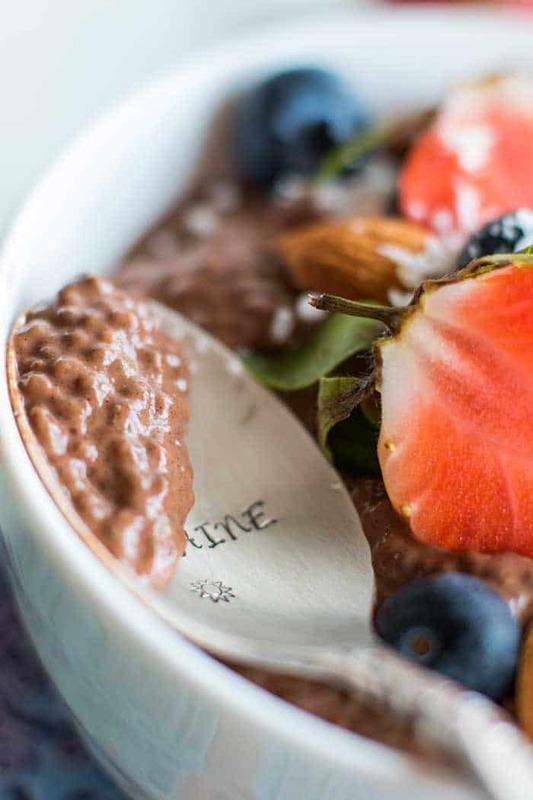 This Chocolate Chia Pudding post contains affiliate links. This means that if you make a purchase, I receive a small portion of the sale. This helps me continue to bring you healthy and delicious recipes to Sunkissed Kitchen. 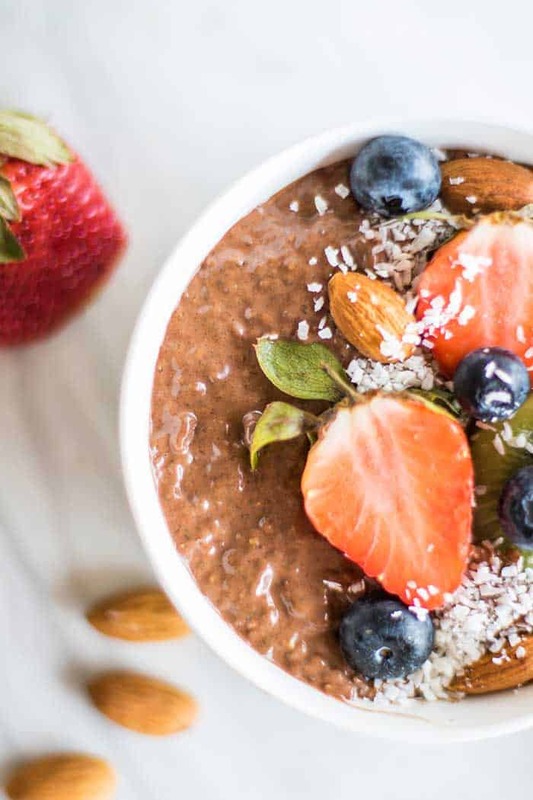 I've never made chocolate chia pudding before but it looks so delicious, I need to try this asap! It is delicious -- such a great texture! If you like tapioca, this is so similar. This looks amazing. I love all the colors and textures you have here! Love your photos and the pudding looks and sounds delicious! This looks like a scrumptious breakfast! Love the spoon too.